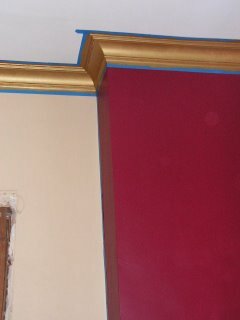 Here is a great picture of the newly painted gold crown molding. We looked at possibly stripping it too, but it had a horrendous dark brown paint and so we decided to complement the colors we used in the room... I must say that it looks lovely. Love your crown molding. Do you mind telling us what product and technique you used? Thanks. It all looks so beautiful you did a fabulous job of painting w/detail in mind. Lookis Great guys! Too all who may read this entry, let it be known that Chris And Blair are probably the most deserving people of a home with such history and beauty. Amajority of the beauty still lies behind paint and wall paper but I know for a fact that its there... I've been fortunate enough to have worked with this nice couple on occassion and look forward to their next entries... Dont lose the momentum.... Kaos.